Just like its rivals for consumers’ disposable income, America’s $90-billion-a-year gaming and casino industry is significantly driven by database marketing. But gaming customers are very different in one major respect. While adult patrons of a hit movie, for example, know they will spend about $8 to $10 on a ticket, perhaps buy soda and popcorn and then head home, some casino customers lose huge sums of money while a few others might actually make a profit, especially those who are skilled at games such as blackjack. Can casino owners more accurately identify and predict which of their regular customers will lose the most money? How often will these customers visit? How will they allocate their bets among slots and tables? By targeting those players, can casinos follow up with a more effective direct marketing campaign? The questions inspired two Wharton faculty members and a colleague at New York University’s Stern School of Business to see if they could develop a mathematical model to identify these most lucrative customers. The three researchers — marketing professors Raghuram Iyengar and Jehoshua Eliashberg, and Sam K. Hui, a marketing professor at Stern — say that the answer is an unqualified yes. Indeed, they wonder why casinos aren’t already using these tools. The study by Iyengar, Eliashberg and Hui — entitled “A Model for Gamers’ Revenue in Casinos” — develops a mathematical model which integrates gamers’ frequency of casino visits, their total wagers and the distribution of those bets at table games versus slots machines. The researchers determined if revenue from specific players was derived from “skill” or “luck,” and they were able to identify players who are highly skilled or perhaps revenue-producing high rollers. While the characteristics they studied are fairly unique to the gaming industry, the authors said there are other business situations in which customers can be identified and targeted based on their specific skills or unusual customer behavior. For instance, they noted that better modeling of customer behavior might help hotel managers to more intelligently market the use of mini-bars or business centers, or allow car-rental firms to target extra-cost products like GPS units or satellite radios. But it is the sheer size of the casino industry in the United States that makes it such a strong candidate for this kind of individualized predictive modeling, more commonly known as database marketing. Americans spend more money on gaming than on trips to the cinema by a 10-1 ratio, and more money is lost during a typical casino visit than is spent in an average visit to a mall. Of the $90 billion spent on legalized gaming, according to the American Gaming Association, some $59 billion is spent in casinos as opposed to lotteries or pari-mutuel wagering. Unique aspects of the casino industry suggest that casino operators should be developing different tools for customer relationship management than, for example, mall operators — who analyze how much customers spend on a typical visit to a store and what products they purchased. Through the use of gaming loyalty cards and other tools, casino executives have the ability to more closely track the performance of individual gamers. Access to such player-level behavior, together with mathematical modeling, can help uncover a gambler’s level of skill — an important consideration in determining the individual targets of direct marketing campaigns. Iyengar and Eliashberg noted that casinos already perform broad mathematical calculations — based on aggregate behavior — in an effort to predict their overall revenues and profits. The goal of this research, they said, was to come up with a mathematical model that would measure the difference between a typical player’s theoretical and real spending relative to the player’s skill level. The use of a “formal model, which makes clear distinctions among individual gamers,” is a more effective tool than a casino operator’s “judgment based on intuition,” Eliashberg stated. The data that researchers examined came from a major U.S. casino operator with gambling facilities in a number of U.S. locations. It provided the authors with detailed information — gathered through the use of loyalty cards — on more than 1,500 customers who made a total of about 9,000 casino visits from December 2004 through April 2007. The gaming company also offered age and gender information for about 400 of those customers. To determine the skill of the players, the authors ran through a series of complex calculations based upon factors, including the particular games the individual played, the expected take by the casino versus the actual take, and whether a gambler’s winning or losing on one visit affected behavior on the next. While the researchers noted that more work must be done to learn how a gambler’s skill improves at a game, such as blackjack, over time, they believe their model can be a powerful starting point. 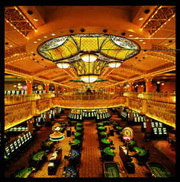 For example, the authors predict that this new and more detailed type of data can be combined with customer survey results to obtain much better information on so-called “share of wallet” — that is, how much of the money that a gambler budgets for the casino is actually lost on a visit. Beyond that, they also urge additional research on casino promotional activities — such as complimentary hotel stays or cash-back awards — in order to develop a better sense of how marketing efforts affect high and low revenue gamblers differently. In addition, they note that the customized data could help operators as they weigh how to better design their casino floor space to increase revenues, such as the use of environmental cues to encourage gambling or altering the ratio of table games to slot machines. “The behavior may change from one facility to another, but we believe this information is helpful in designing your facility in line with customer behavior,” Eliashberg said. In future research, the authors note, they would like to examine more demographic data such as relationship status, home address, profession and education level to gain even more insights into gambling habits.